#If I have ever hated any other place more than India, it is Ecbatana. Nothing wrong with the city. Just the memories. My personal demons feast there every day as I look back at that time. I have shed more tears for the memory of that place than to any other’s. I will shed them now, as I write this. It is inevitable, and I fight it no more. The door was opened, and Hephaistion turned to look at a young servant. The boy bowed at him shakily, lowering a tray to a bedside table. A cup, with bottles of water and wine. The boy even forgot to bow in his haste to leave, closing the door with a sharp bang. Hephaistion shook his head, his smile dry of all emotions beside irony. He had learned to see the signs during his years beside Alexander, and this attempt was so visible it made him want to laugh. Or go after the boy and teach him some proper ways to deliver death. He did not do either. Turning back to the city, he noticed a group of men walking beneath his window. Laughter echoed from the stone-walls, every single voice familiar to Hephaistion. He had fought with these men many times. When a boy, he had looked up at some of them with wonder as they commanded Philip’s army. Now they served Alexander. Generals of his father, and those of his own age, walking together as if they shared something to unite them. And today, they probably did. Cassander was the one to look up, to boldly meet his eyes. For a moment Hephaistion wondered it he had already killed the servant, or paid him sick. Either way, it did not matter. Hephaistion had known this day would come quickly after Alexander had named him his chiliarch. It was another obstacle for Alexander’s opponents to overcome if they wished to gain power. And most of the greatest opponents walked right beneath his window, at the moment. Yet it is not their decision, but mine alone. Maybe this was a point when they decided to send the boy in, after all, Hephaistion snorted. Maybe I should laugh, indeed. He turned away from the window and slowly walked to the low table. They offer me the way, an escape on a silver plate, the thought wryly, his fingers caressing the silver tray. I give them… a solution. “Water or wine?” he pondered aloud, chewing his lip. 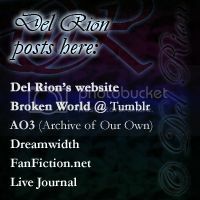 “Oh well, better to be certain,” he finally huffed, taking the cup to his hand and filling it with both, wine and water. His every movement was unhurried, as if savouring the moment. His hands did not tremble. He was in no hurry. The first taste of liquid betrayed nothing, and for a moment he was afraid he had been deceived. But after another mouthful, he felt it. He emptied the cup swiftly, clenching his eyes shut. He filled another, just to be sure. After a third swallow he was unable to take more. He lowered the half-empty agent of death back to its place on the tray, and sat down onto the bed. He longed to go and take a one more look at the world outside, but he was not sure if he could make it. After a moment he finally gathered the courage to stand up and walk to the windows, every step harder than the last. But he made it, leaning heavily on the frame. How grey it all looked, now. Or maybe his eyes were failing. A sob escaped from him, and after it came the tears, freely now. He didn’t even know for what or to whom he was crying. Maybe to his own, pitiful end. I couldn’t even reach the glory of Patroclos’ death, he lamented, sliding down to the floor. Everything seemed to fall silent, as if waiting the right moment to wake him with applause. Hephaistion closed his eyes, trying to breath evenly, but his chest burned. The wall was cool under his forehead, speaking of rising body-heat. He only hoped they had picked a swift poison: he had done enough for them in the past to deserve an easy death. “Hephaistion?” came a muffled call from the other side of the door. The voice sounded distant in Hephaistion’s ears, but it seemed to clear some of the haziness in his thoughts, also. “Hephaistion, are you there?” the voice called out again. “I know it is early, but I wished to speak with you before the feast…” There was a pause, as if the person on the other side was waiting for an answer. ‘Go away’, Hephaistion mouthed. But if he guessed correctly, the person at the door would not leave by such a command. He blinked, trying to force the tears back. The fingers of his left hand curled on the stone to a verge of pain, but it took a rather long time before he actually felt anything. How slowly the death could come when one waited for it… The door was opened and Hephaistion was able to tell when the other man came in line of sight with him. There was an audible gasp and hurried steps. Curse Ptolemy and his good timing. “Hephaistion! What is wrong with you? Are you sick?” Ptolemy asked as he moved Hephaistion to lean against his body. The other’s skin was burning with fever. “Hephaistion?” he shook the other gently, trying to coax a reaction from it. This was far from what he had expected to find from the other’s rooms. “I will get a doctor,” Ptolemy decided, seeing Hephaistion’s pale face and hollow eyes. But the hand that grabbed his shoulder was firm enough to stop him from leaving. “Hephaistion, please! You are ill,” Ptolemy tried, knowing that reasoning with the other would probably lead to nowhere. 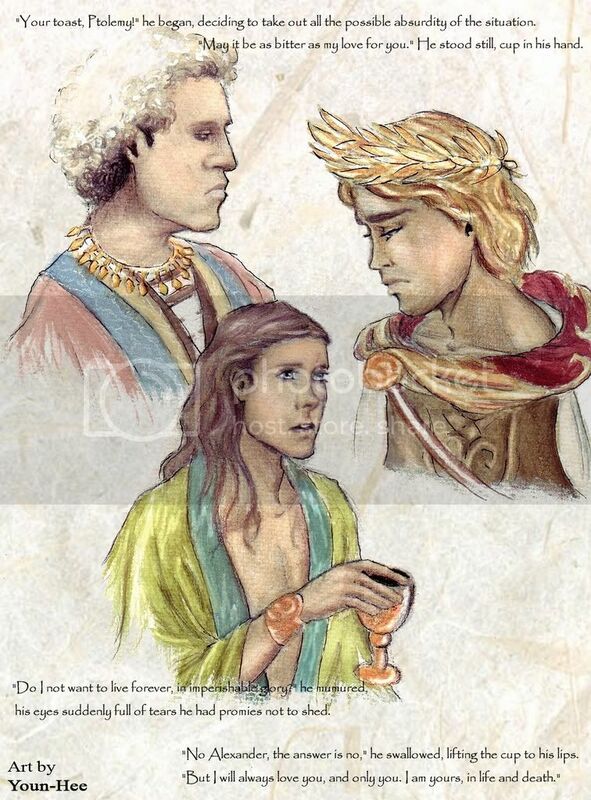 Hephaistion shook his head, his fingers burying to Ptolemy’s skin. “What is wrong with you?” he asked, realising he was not going anywhere before Hephaistion would allow him. Ptolemy didn’t think he did, but refused to argue. “Let’s get you to bed.” He gave the other no time to answer before picking them both up from the floor. It was not easy to support Hephaistion’s limp weight, but he managed to get him to the bed and under covers. He directed one, loathing look at the cup still partially filled with liquid, but knew there was nothing to be done. “I’ll get the doctor…” he muttered. Once again, Hephaistion caught Ptolemy before he was able to leave. This time it was not bodily restrain, but words. “Please, stay, Ptolemy,” he called out. Isn’t it strange when you suddenly don’t want to be alone? But why to die unhappily, if you have a chance… Ptolemy turned to look at him, already half-way on the door. “I don’t want to be alone… I don’ t want to die alone.” It was enough to send the other man back to his side. “You are not going to die,” Ptolemy hushed, brushing sweaty strands away from his lover’s face as he sat on the side of the bed. “Take care of Alexander. I fear for nothing else. Protect him, as you have now. I can… no longer do that… for either of you,” Hephaistion said brokenly. “My time has come. Not maybe the way I would have imagined it, but… This will do.” He nodded sternly. “I…” Ptolemy closed his mouth before he said another word. His eyes found the cup again, mind catching Hephaistion’s earlier words. “ Your toast was as bitter as I thought it to be.” He moved his gaze back at the man on the bed, but was unable to meet his eyes. Guilt ate him from within. “Did you do this for me? Because of us?” Suddenly there was a hand on his face, turning him to meet the pained, blue eyes. The fingers trembled, speaking of power that was fading, and he covered them swiftly with his own, wishing to maintain the contact as far as possible. “Do you see regret in me? In my eyes? Did I ever tell you to stop, to not touch me?” Hephaistion demanded, his voice coming out as a hiss. Did I ever… “No,” Ptolemy whispered. Ptolemy did not laugh. His eyes remained serious, just like those staring at him. “You will tell him.” The answer was in Hephaistion’s eyes, clearly spoken with his tears. Ptolemy leaned closer to him, his voice barely above a whisper. “I understand. And whatever he will decide… I die knowing one thing: either of us did not regret. Not a single day. Not a single hour.” He sealed his promise with a soft kiss, which Hephaistion gladly accepted. The touch of their lips was short but intense, the feel of it lasting long after. “He has the right to know,” Ptolemy finished, trying to steady his shaking voice. “And you have the right for peace. A peace only truth can give.” Then he stood up, with a one more touch of hands. He did not say the words. They did not matter. Not anymore. #Those who love too much, lose everything. Those who love with irony, last. You can easily guess which one of those I did. The fact I never said the words to him does not mean I never felt it. Now that I have come this far, had this through my head one more time, I know it. I loved him. I still do. I went to search for a doctor, hoping Hephaistion would still be alive when Alexander would be found. When all the arrangements were made, I did not dare to return to the room I had left some time earlier. I did not tell Alexander, either. I send someone else to do it. After I knew all possible was done, I wondered through the halls of Ecbatana like a ghost without destiny. I did not think. I did not shed tears. When I finally returned to Hephaistion’s room, Alexander was already inside. I wished he would say the right words, once in his life. Alexander was a great king and general, but in affairs of love he usually lacked. For once, I prayed him, say the right words to Hephaistion. Give him an end he deserves. A great amount of men had gathered near the door, waiting anxiously. Soldiers, servants, other generals... Like vultures, knowing they would soon feed upon a new body. I was disgusted by them. I wanted to turn away, to lock myself into some dark, small room and let it all out. Frustration. Self-hatred. Pain. None of those has lacked up to this day. I doubt they ever will. The moment of his death must have been painful. I saw it in his still-open eyes as we rushed into the room in a wake of Alexander’s screams. All the city knew in a fraction of a moment that something great had happened. Some celebrated, I am sure. Opened a new cask of wine, red as his blood. Drank upon it and thought about the amount of power they had just gained. And how wrong they all were. So wrong it made some of the pain of his passing seem compensated. Alexander named none after him. Liars, he called us. At that moment I knew Hephaistion had not managed to tell him. Alexander called us liars, and was more than right when he blamed us of hating him. It matched most in that room. But what more strongly spoke of his ignorance was that he did not kill me as I tried to draw him away from Hephaistion’s body. He merely accused me, like he accused everyone else. Later, when the situation had calmed some and Alexander had retired in his grief, I went back to Hephaistion. I closed his eyes and sat next to him for hours. Then I wept. If someone had come in, they would have seen a friend mourning another’s passing. Maybe Alexander could have seen the difference. I was not bothered, however. It did not matter, either. I would have welcomed death, that day. It was also the last time I kissed him. As cold as his lips were, I imagined he felt it, my goodbye. There is no word for the emotion Alexander suffered after Hephaistion’s death. Perhaps they will make one, later. He was as a man possessed. After a moment of grief, he moved on. There is nothing to compare in the bloodshed that took place during his next few campaigns. That blood, by no mistake, flowed to Hephaistion’s memory. It is more significant in my eyes than the huge pyre build in Babylon. We lost Alexander on the day of Hephaistion’s passing. As I had known years before, he was impossible to control after he lost his lover and long time companion. When the time came, at June 323, I broke my promise to Hephaistion. I was there, that night, when Alexander drank the poison set into his wine. I did not aid in killing him, but I acted in no ways against it. I allowed it to happen. I think he knew. They way he looked at us told everything. Perhaps he was ready, too. Everyone knows I took Alexander’s body to Egypt to bury – against the wills of everyone else. Few know, however, that I also brought Hephaistion’s remnants there. It cost me much, but at least I was able to set them in their eternal rest together. “I don’t know…” Ptolemy muttered to himself, lowering the pen. “Of course I do, but I have no words for that, either.” He smiled, drawing his free hand across his features. He did not encounter skin of an young man, but wrinkles of one old. He felt old, today. Glancing down at the parchment in from of him, now half-written, he tried to decide if the end was good enough. It would never be ‘perfect’, but ‘good enough’ he could suffer with. Some of the lines would make no sense to an outer observer, unbalanced and without real meaning. But to him, they meant everything. Towards the end, the string of story broke into paragraphs separated from each other, but he had not the power to make it perfect. After Hephaistion’s death, all he had known was some state of chaos. He read through the lines again, frowning to himself. He could see imprints of tears, staining the ink at places. There were a lot of stains like that, on the other pages as well. “What about the end…” he mumbled, his fingers searching the table. He encountered the bracelet, bringing it to his lips. “Ah. Exactly. There is no end, not just yet. I am still alive.” He smiled and put away the pen, glancing out from the windows. It was already dark outside. Some of the servants must have entered while he had been writing, lighting lamps near the desk. They gave the room a golden glow, shadows flittering across the walls as a breeze made its way inside, taunting the flames. In shadows, he imagined he saw pictures. Visions of past. Finished with his task, he went to the wide bed on the other end of the room. Sliding out of his clothes, he drew himself under the rich covers. He stared at the embroidery on the canopy above. He had once taken hours to follow each curve. Tonight, he had lost interest. He had seen it enough times to let it be. Slowly his right hand sought the bracelet again, resting upon it. Lowering his gaze, he stared at the foot of his bed. If he was waiting something, he did not have to do so for long. Like a golden glow, a shape appeared before him. It might have been completely his imagination, and even if it was, he cherished it more than any living thing for years. He could actually smell him. “Hephaistion,” he whispered brokenly at the glowing form. A soft laugh echoed through the air, distant and yet so familiar. A call of a past. The figure moved to the side of the bed, sitting down on the edge of it. Ptolemy did not feel the pressure on the mattress, but it was not his concern. He saw Hephaistion, and it was all that mattered. “Hephaistion,” he whispered again. Hephaistion smiled, their eyes meeting. Ptolemy felt a hand upon his, upon the bracelet. The touch was warm, comforting. “It is time”, Hephaistion said, his words like music in Ptolemy’s ears. He looked back, suddenly, and when the pharaoh followed his gaze, he saw another shape. “Do I have your forgiveness, Alexander? May I join you?” Ptolemy asked. There were tears in his eyes when the other familiar figure nodded, then faded from his sight. Afraid that he had lost them both, Ptolemy swiftly turned to look aside. Hephaistion was still there, smiling down at him. There was a touch of sadness on his face, one that Ptolemy had grown accustomed during their long years together. But now all the pain was gone. “Very soon,” he whispered, receiving a nod from his long-gone lover. Hephaistion tugged his hand as he rose, like a God above him, and then walked to the open doors of the balcony and beyond. He looked back, smiling. Ptolemy’s eyes lost the sight of him, but his heart knew he was still there. Waiting. With a deep intake of breathe, Ptolemy relaxed on the mattress, his fingers again caressing the bracelet. He smiled, closing his eyes, knowing all he was supposed to do was done. He had witnessed men greatest of his time, and his part was done. He felt peace. And again we shall be united. A wind blew out the torch still burning in the middle of the room, and all that remained was darkness. Author’s Notes: Perfect. You saw that? “The End”. Finally. After all these months, we finally have reached it. “The End”. This is such a relief for the author, and I guess it is so for the readers as well! I will miss this story, I know. Maybe enough to extend it, someday. After all, there isn’t too many stories of Hephaistion and Ptolemy (I haven’t seen many, that is). And this story is definitely the best from me, this far. It will be always close to my heart. Remember to review, and so on. It is always nice to know if the last chapter (especially in a fic like this) put the finishing touch to the story, so to say. All feedback is welcome! I will try to respond to you people in person, but there will be always answers in the end of the chapter itself too! Your lover is dead in your game. Rush to nowhere in a land of crippled lies. Call me Jesus and they’ll crucify. Blood is blood when a word can tear you down. Burn you to ashes with the look. Love to make you the queen of godless. Pain is pain when a world will bring you down. Turn to tame my will as you crave. Scent of a game in a world beyond my touch. Called you angel and they crucified. In trust of no one the treason is wearing your name. Your life is a desperate game. This I believe in, the stronger my faith fades away. Dreams are hollow if you fall. “It is done”, when I loved no one. and I’ll show you why. falling needles on my path. It really moved me to tears. Very intriguing idea that Hephaistion knew the water/wine was poisoned. And I really like your Cassander. Your fic has left me with this feeling that yeah, Alexander could have treated Hephaistion better. I always felt like that (Bagoas??? wtf, Alex??) but reading this gave it a different edge to it. I really liked how you described the tension the two times they almost got caught and I was sure Alexander was going to find out about them before the end. I'm surprised you didn't bring up the fight Hephaistion had with one of the other generals, I was almost expecting it thinking Ptolemy would have a say on it... and that Alexander's assholery would have something to do with it. To sum up, wow, brilliant work. You should get it published or something :) I'm impressed by the length and by the beauty of your style. The story flowed really easily. I loved it. Oh.... <3 I am all shining eyes here ;) such a brilliant review! Hmm... that fight with Cleitus is a very popular thing (I have to learn more about it, though..). I actually have a poll on my website, asking if I should continue this story in the furure (read: write more chapters in between the already written ones, to make it like an extended version or something...). I would have welcomed death, that day. It was also the last time I kissed him. As cold as his lips were, I imagined he felt it, my goodbye. this was very good, oh the angst! how we love to feel their pain and make it our very own. when mmara mentioned your alexander fics, i had to check them out, and i'm glad i did. All the pain was so damn well written that I loved reading it even though it almost killed me at times.. but that's why it is such a great story. Thank you so much! love you for sharing your wonderful story with us. Especially happy I'm about the fact that you felt the story was realistic, and that it made you feel with it. That's about all the writer can hope to hear from the readers! I found your journal few weeks ago. I have started read 30STM stories and I skipped stories about A&H because I do not like this paring too much or I rather should say I have not liked them. Your are great writer. Your way of writing is extraordinary. What I am looking for are good tell story and emotions and I prefer series. It is quite difficult find something worth to read in 30STM universe.It it big gap but you are one of my favorite writers who bridge this gap so perfectly. When I started read this story I dose one chapter at time in order to not finish too fast. I have taken such a pleasure in reading that thinking about finish this made my sad. But now it's over and done. I have just reach the end of this story and I am crying like baby despite of fact I am not crybaby type of person. I like your sensitivity, your expanded style and retrospection. All this make this story so sad but in a good way. Your characters have personality and all this disadvantages of character and little imperfections make them so real and it's make you like them or dislike and forget that they are only products of your mind. Your Hephaistion is so lonely, miserable but strong that it is impossible not love him totally and bite Alexander for left him behind. Who would want be king half of the word when was possessed of love someone such miraculous like Hephaistion? And thanks to Zeus for Ptolemy for his love and friendship and for being on Phai side. And one thing more. Moments of intimacy, not only sexual one between Ptolemy and Hephaistion are wonderful. I had melted constantly. Thank you for share with us your skills, imaginary and talent. I do not make lot of comments because my language skills are not too good and it make my a bit embarrassed.